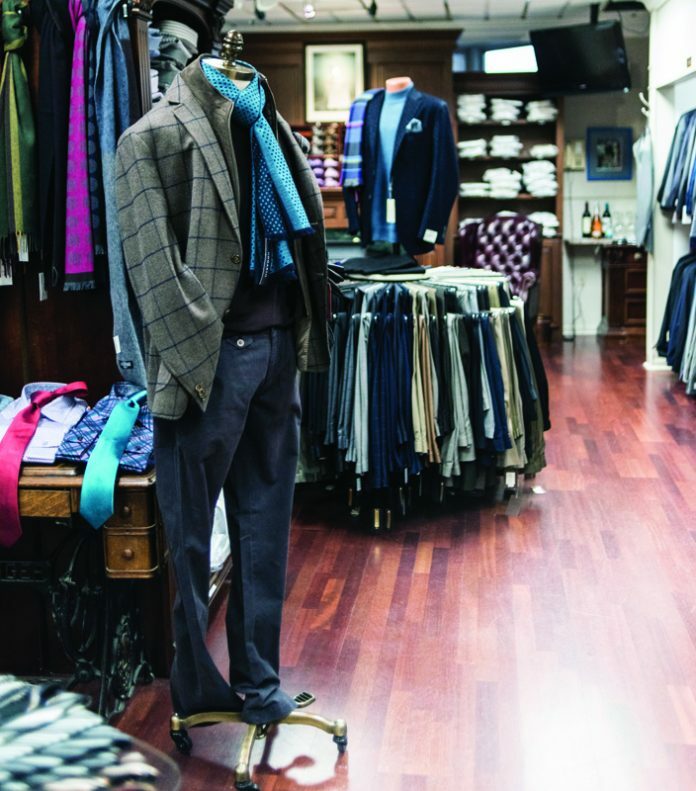 Manno, in Dearborn, doubles down on men’s clothing and tailoring. At a time when buying menswear, whether it be dress shirts or socks, is just a couple of clicks away on the internet, Pat Manno has doubled down on the idea that top-quality clothes altered by a tailor from the old country are more desirable than a fitting that uses algorithms. 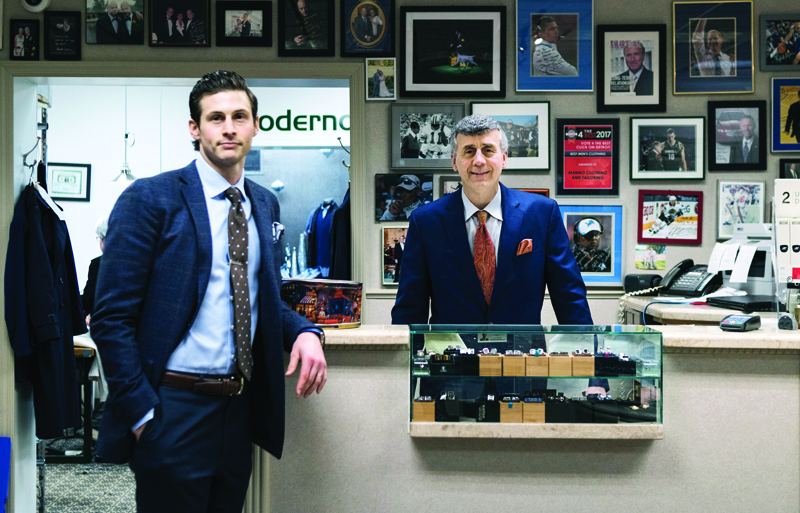 Rather than watch Manno Clothing and Tailoring in Dearborn shrink as his regular customers age, the owner opened Moderno, a companion store, in 2017. He says Moderno targets younger customers who want to dress well in a contemporary, rather than classic, style. Manno recruited his fashion-conscious son, Anthony, to run the new establishment. A half-dozen Italian tailors, sewing machines, steam irons, and presses bridge the two shops on Michigan Avenue, just east of Telegraph. The elder Manno says showing off his artisans working on suits that range in price from $500 to $1,800, and come from venerable makers like Hart Schaffner Marx and a host of Italian fashion houses, instills confidence in customers. Pat’s father, Leonard, opened Manno in a 400-square-foot storefront in 1971. He and his wife, Lilla, had immigrated from Sicily to Windsor, Ontario, and Leonard commuted to Detroit to work at Whalings and J.L. Hudson’s, where he was the personal fitter for J.L. Hudson before pursuing what his son called “the American dream” of store ownership. Leonard died last May, at 85. While Anthony was away, Pat gutted the property he owned next door, adding retail space and inventory. He figured he could make more money in two or three days than he could collect in monthly rent. The stores resemble each other in merchandising, but differences extend beyond what adorns the mannequins. Pat Manno and his staff greet customers by offering them coffee or a glass of wine, while Moderno has a self-service espresso machine. Prices also are a bit lower at Moderno, which caters to a younger crowd and offers a more contemporary fit. Manno Clothing and Tailoring cultivates regular customers of all sizes, many from nearby Ford Motor Co. The store is open six days a week, but Pat will open at off-hours on request. “It’s a service business before everything else,” he says. In the summer months, the Mannos take on full wedding parties, and even will alter bridesmaids’ dresses. “For the cost of renting a tuxedo twice, you can buy a custom-fitted suit that will last you 10 years,” Pat says.